The paper presents propagation rules that are common to the minimum constraint family and to the number of distinct values constraint family. 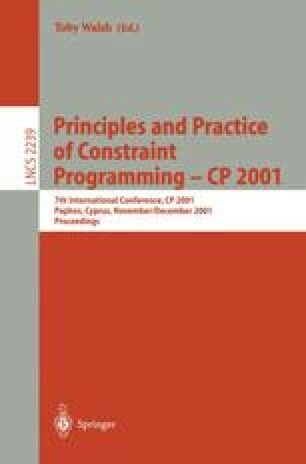 One practical interest of the paper is to describe an implementation of the number of distinct values constraint. This is a quite common counting constraint that one encounters in many practical applications such as timetabling or frequency allocation problems. A second important contribution is to provide a pruning algorithm for the constraint “at most n distinct values for a set of variables”. This can be considered as the counterpart of Regin's algorithm for the all different constraint where one enforces having at least n distinct values for a given set of n variables.